Information and specialist terminology relating to berbel extractor hoods and kitchen ventilation technology explained quickly and in a way that's easy to understand. The cooking vapours are sent outside through pipes with a diameter of 125 mm or 150 mm. Ideally, a berbel wall box connects the pipe to the outside. This makes for an effective, energy-saving exhaust system. Do not reduce the cross section of the exhaust path. 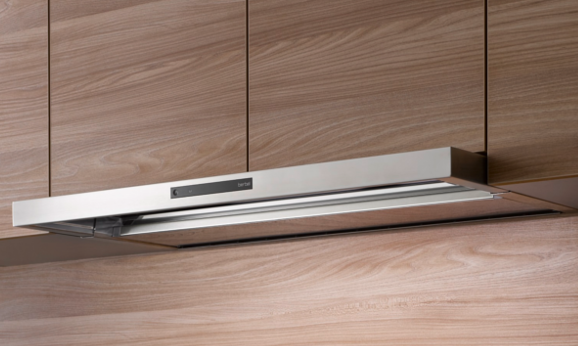 Extractor hoods with 150/125 mm air outlets have specially chosen, powerful fans. These require appropriately dimensioned outlets. Reduced cross sections also reduce the air flow and increase noise. If reduced cross sections cannot be avoided at the place of installation, a berbel hybrid active carbon filter should be used to effectively minimise these performance losses and prevent an air "backlog". berbel has made use of physical centrifugal force for the filter-free cleaning of cooking vapours. The cooking vapours - loaded with fat and oil particles - are greatly accelerated and pushed through bends in a targeted manner. The centrifugal force now separates the lighter particles of air from the heavier particles of fat and oil. Lastly, the fat and oil is directed into stainless steel collection trays. Once cooking is finished, you can simply open the trays and wipe them out. The cleaning of collection trays has never been as hygienic as now! And best of all: The air cleaning quality remains constant for years. berbel Pro Aktiv active carbon traps odours particularly efficiently thanks to its great quality. For lovers of fish, a specially treated active carbon with a high phosphate content is available. This is ideal for trapping even intensive fish odours. The high content of active carbon and large surface make the berbel recirculation filters unbeatable when it comes to binding odours. With berbel recirculation filters, only the active carbon granulate needs to be replaced. This lasts for 350 operating hours, so around 2-3 years. In the case of slanting glass surfaces, the conjunction of hot water vapour and the cold decorative surface can result in condensation or drop formation. The unique berbel BackFlow technology prevents this. On the rear of the hood, some of the air is conveyed back and over the glass front again. This secondary ventilation keeps the decorative surface free from condensation at all times and the diversion of the cooking vapours into the intake opening is more targeted. A useful side effect of this secondary ventilation is particularly high vapour capture efficiency and thus effective air cleaning. Roof feedthroughs must also have the same cross section as the exhaust duct. Any reductions in the cross section can result in significant performance losses for the extractor hood. Ventilation tiles made from fired clay are normally not terribly suitable from a flow point of view, since extremely high air counter-pressures can arise. In addition, they are often available only with a diameter of 100 mm or 125 mm and are therefore not recommended. Here, in the ideal case scenario, a butterfly valve that offers protection against draughts and pests should be used. If used in a vertical pipe, a condensate separator should be installed to deal with the problem of condensate. The insulation value is specified in W/m2K. This value states the quantity of heat in watts that escapes through a solid body. The U-value is calculated by measuring the heat loss in one hour over one square metre of a component at a temperature difference of 1 Kelvin (corresponds to 1°C) between the inside and outside surface. The smaller this value, the better the insulation provided by the component. The berbel wall box is one of the few products on the market that achieves excellent energy saving values with an insulation value of 0.95 W/m2K. The excessive distance between the hob and conventional ceiling fans often means that these fans don't perform sufficiently. Here, berbel ceiling lift hoods are the ideal solution: They can be moved from the ceiling towards the hob by remote control and positioned at the perfect distance from the hob. This ensures top vapour capture efficiency. Ceiling fans are mounted directly beneath the ceiling above a cooking area (usually a kitchen island) and their flat design is intended to allow them to integrate into their surroundings as unobtrusively as possible. However, note that fat and oils from frying do not reach the required height of 1.50 m above the hob (2.4 m ceilings and 90 cm working height). This is because these molecules cool down on their way up - and simply fall back down again. In the case of these conventional ceiling fans, design is given priority. At the expense of functionality. With berbel ceiling lift hoods, you have the ideal gap for top vapour capture, and if the hood is not used, it moves under the ceiling so that it does not obstruct your view. A downdraught extractor hood is an extendible hood (sometimes with a remote control) that moves out of the worktop behind the hob. Here, too, remember that cooking vapours naturally move upwards. The Moveline table lift hood therefore bends elegantly over the hob so that most of the cooking vapours from the front of the hob can be captured, too. An extractor hood is ideally located above the hob. It extracts and filters cooking vapours consisting of fats and oils. Traditional extractor hoods consist of a motor, fat filter, light, control panel, and - for recirculation mode - an active carbon filter. berbel has revolutionised extractor hood technology: At the heart of the principle is centrifugal separation, which ensures top reliability, easier cleaning, and lasting whisper-quiet operations. Extractor hoods are also sometimes called vapour extractors, steam extractors, fume hoods, fume cupboards, and extractor fans. 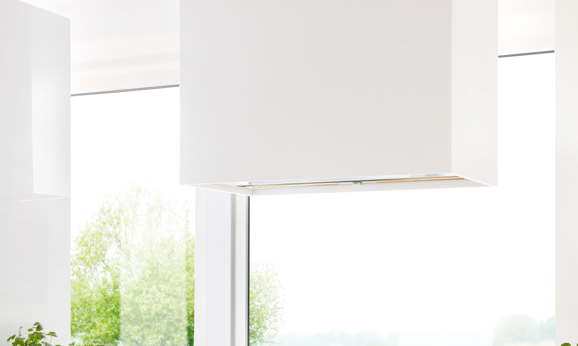 With EcoSwitch, berbel has developed a technology that enables the versatile use of extractor hoods: In summer, your hood can work in exhaust air mode, and in winter, you can switch it to recirculation mode. This works due to berbel's intelligent overall system. It consists of an active carbon filter in the hybrid version as well as the berbel wall box. This allows you to switch flexibly to the appropriate operating mode depending on the current cooking and weather situation. Easy to operate thanks to the EcoSwitch button on the control panel of many berbel hood models. The EC (electronically commutated) motor is an electromechanical converter (electric machine) that converts electrical energy into mechanical energy. EC motors are used in berbel extractor hoods because they are particularly energy-saving, durable, and quiet. EC motors are already used as standard in most berbel models and are available for other models at a surcharge. Built-in hoods are located in the top cupboard. Usually, the fan box is discreetly hidden behind a spice rack, for example. When the head profile is extended, the built-in hood starts doing its job. This enables the efficient collection of vapours that rise from the front of the stove, too. Alternative terms are flat fans and flat hoods. A hood with an external fan does not have its own motor. The motor is either on the outer wall or integrated as an inset fan in the exhaust duct. This allows all motor noises to be displaced from the kitchen into a separate room such as the attic or even directly to the outside. 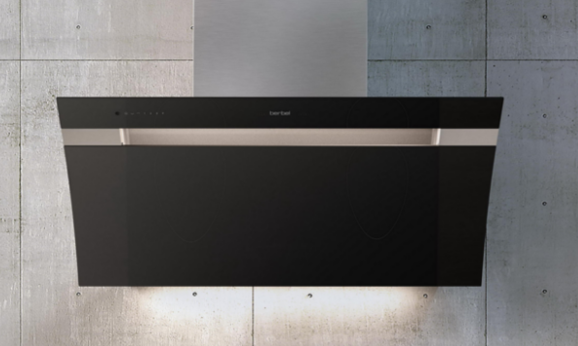 No motor is integrated into the extractor hood itself, since the external fan - installed directly on the outer wall - pulls the vapours out of the kitchen to the outside. It is operated directly from the control panel of the extractor hood. berbel offers a berbel inset fan for use inside and a berbel external fan for attachment to the façade of the building. Describes the process of separating fat and oil particles from the air. A fat filter is used in traditional extractor hoods. It removes fats and oils from the air. Fat filters are available as expanded metal filters, paper filters, and fleece filters. Depending on the material used, the fat filter must be either cleaned or completely replaced once it is saturated. Laboratory tests have shown that tiny bacteria cultures can grow in the centre of multi-layered filters even if they are cleaned regularly. In addition, as they become increasingly saturated, fat filters can separate less and less fat, and flow resistances occur. The extractor hood thus becomes louder and requires more energy as well as suffering from a reduction in the fat separation rate. Furthermore, these filters obstruct the natural flow path even when cleaned regularly, since resinification can occur inside them, causing lasting air flow resistance. These reasons inspired our engineers to develop the filter-free berbel principle. If an extractor hood and an open fireplace are in use at the same time on the same storey, it is vital to ensure a sufficient supply of air. This can be done using a berbel supply air wall box or a berbel (remote) window contact switch. An authorised chimney sweep must check the setup before it is used and might insist that a low pressure monitor be installed to prevent any health risks. We recommend that you request advice from your chimney sweep in advance if planning an installation of this kind in order to avoid unnecessary rework and the associated extra costs later on. berbel has made use of physical centrifugal force for the filter-free cleaning of cooking vapours. The cooking vapours - loaded with fat and oil particles - are greatly accelerated and pushed through bends in a targeted manner. The centrifugal force now separates the lighter particles of air from the heavier particles of fat and oil. The latter are separated as they ricochet against the edges and are directed into the stainless steel collection trays. The air cleaning quality remains constantly high for years. Another advantage: Because flow resistances are virtually impossible with this technology, berbel extractor hoods can manage with a lower fan power. This means a lower use of energy and reduced operating noise. 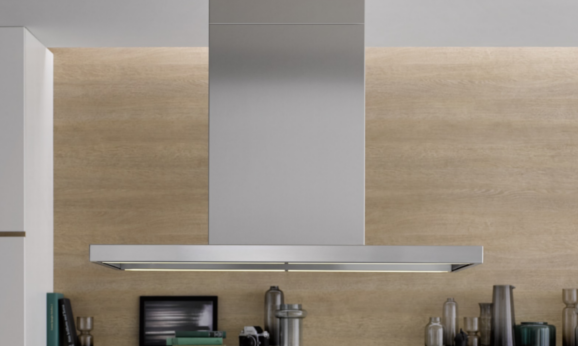 Since the installation height of an extractor hood is often influenced by constructional requirements, the effectiveness of the exhaust technology can be increased by a larger width overlap. This means that a little tolerance in the installation height is possible, too. For the best fat separation results, berbel recommends that you choose an extractor hood that is at least 100 mm wider than the hob. The berbel hybrid filter has several functions. On the one hand, it increases the filter area in pure recirculation mode, since it reduces the physical air resistance of the recirculation filter. In the case of exhaust ducts with a reduced diameter, the berbel hybrid filter can be used as an overpressure valve. This directs accumulating air back into the kitchen once odours have been removed, almost completely compensating for performance deficits. Ultimately, a hybrid filter is an important component of the new berbel EcoSwitch system. Island hoods are located directly above a kitchen island. Instead of being attached to the wall, they are fixed to the ceiling. They are a visual highlight in modern kitchens, but also have impressive technical features. Thanks to their diverse width and design versions, berbel island hoods can be integrated into practically any kitchen concept in an individual manner. The distance recommended by the manufacturer of the hob must be observed with a tolerance of ± 10%. Larger deviations than this can restrict the functionality of the products. Headroom hoods have evolved from wall-mounted hoods. Due to their diagonal design, they have become a separate and popular product category. Headroom hoods enable the convenience of being able to move about freely when cooking. They are also visual highlights in modern kitchens. When buying a headroom hood, make sure that a solution for handling condensate on the body decoration has been taken into account for your model. berbel uses BackFlow technology to prevent the formation of condensate. LED lighting is characterised by its really low energy consumption, high efficiency, and long life. 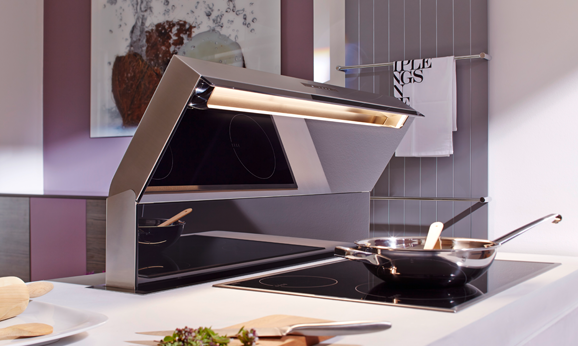 The optimum positioning of lighting in the body of the extractor hood results in the perfect illumination of the hob. The LEDs used by berbel have a colour temperature of 3500 K - this corresponds to a warm-white light. Because lighting in kitchens is becoming increasingly important, we offer a Light Temperature Control (LTC) for some models. In the case of these models, the light colour can be adjusted by the fitter from a cold white to a warm white. Because lighting in kitchens is becoming increasingly important and LEDs can have extremely different colour temperatures, we offer a Light Temperature Control (LTC) for some models. In the case of these models, the light colour can be adjusted by the fitter from a warm white to a cold white (2,700 - 6,500 Kelvin). As a result, the lighting of the berbel hood can be adjusted perfectly in line with the ambient lighting to create a harmonious lighting atmosphere. Like a built-in hood, the fan unit is also integrated into the top cupboard. It disappears completely into the furnishings and is invisible thanks to its flush installation. berbel fan units are mainly used in country houses and minimalist design kitchens. A wall box forms the outer termination of an exhaust duct running from the inside through the wall and to the outside. There are various different wall box versions. One of these is the air-pressure-controlled wall box, in which the exhaust air has to open a flap. This is not flow-optimised. There are also motor-driven electronic wall boxes that open when the hood is switched on and close when cooking is finished. 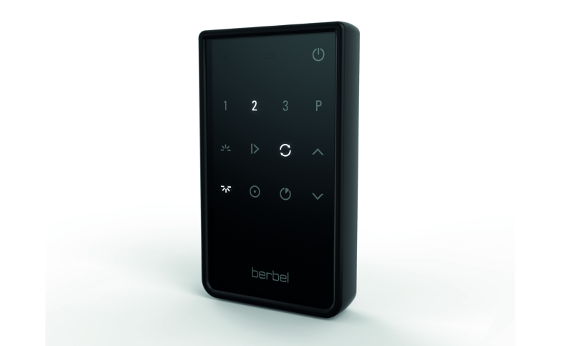 berbel has various designs in its range: The remote-controlled wall box. This opens using a motor and receives its opening signal directly from the berbel extractor hood via a 6 m control cable. Alternatively, there is the air-controlled wall box, which has an integrated flow monitor. This wall box therefore does not have to be directly connected with the hood, and can thus be used with any extractor hood. Air crossflow can affect and divert cooking vapours so that they are not collected by the extractor hood. In particular in the case of island hoods - which are open on all four sides - cooking vapours can be easily diverted from the desired path. In the case of wall-mounted and headroom hoods, the position of top cupboards to the side and the position of any windows is also extremely important. The value of the distance-dependent sound pressure level dB(A) re 20 μPa indicates the amount of noise (noise immission) coming from a source at a certain distance (1 m). In the case of extractor hoods, this is roughly the distance between the cook and the fan when cooking. An increase or reduction in the sound pressure level brings about a louder or quieter perceived atmosphere. When measuring extractor hoods, an "A-filter" is used in order to take the human sensitivity to different high and low tones into account. This measurement method is authoritative when it comes to assessing how noise is perceived by humans and is standard in practically every set of legislation stipulating acoustic limit values. The sound power level dB(A) re 1 pW (noise emission) refers to the amount of noise directly at the source. The sound power level belongs specifically to the noise source. The amount of noise is measured directly on the fan of the extractor hood. Colour choice plays an important role in the design of a kitchen. For numerous hoods, berbel offers the option of adjusting the colour of the decorative glass in line with your personal preference. Here, you should be able to use RAL/NCS charts as a reference when choosing colours. Important to know: Material and light incidence have an influence on the final colour effect. To ensure durability and easy maintenance, we apply colour behind glass. For this reason, small colour deviations from those shown on the colour charts can occur depending on the used material. For special requirements when using an extractor hood in recirculation mode, berbel develops efficient recirculation solutions such as berbel's special active carbon for fish. The odours resulting from the boiling and frying of fish have a different molecular chain structure. If these odours are particularly intensive, they cannot be satisfactorily trapped by berbel's normal Pro Aktiv active carbon. Another feature of berbel's special active carbon for fish: Thanks to special impregnation, the phosphorous content of this active carbon is higher, and intensive fish odours are optimally neutralised. Exhaust air should be directed to the outside by the shortest path available and using pipes that are as straight and smooth as possible. This ensures improved efficiency when using an extractor hood. berbel recommends that reductions in the cross section and the use of flexible tubes are avoided at all costs. You can find a selection of berbel exhaust pipes in our range of exhaust accessories for extractor hoods. In the case of recirculation systems, the sucked-in air is returned to the room. To remove the odours, the air passes through an active carbon filter. This means that the generated heat remains in the room. A recirculation system is primarily recommended for low-energy and passive houses. In recirculation mode, a recirculation or active carbon filter is used to remove odours from cooking vapours. Most recirculation filters contain active carbon to trap such odours. After a certain number of operating hours, filters become saturated and some must be replaced. When choosing which model to buy, pay attention to subsequent costs. However, in the case of good-quality active carbon filters, only the active carbon needs to be replaced. berbel offers environmentally friendly, reasonably priced refill packs for this. A wall-mounted hood is mounted to the kitchen wall above the hob. It features a visible stainless steel shaft that conceals the air duct. 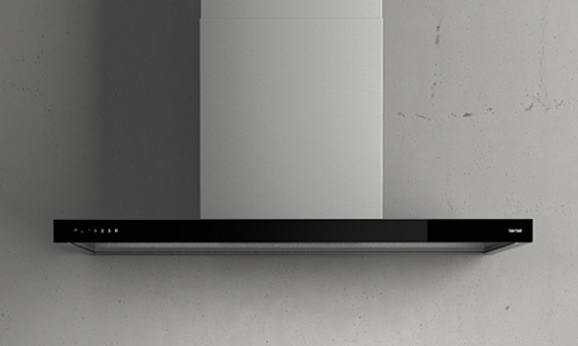 As well as the classic straight-lined design, berbel offers wall-mounted hoods with glass elements. Wall-mounted hoods are also called wall extractors or chimney extractors. Controlled domestic ventilation is used in low-energy houses if the well-sealed construction of the building does not allow sufficient exchange of air with the outside. It means that there is no need to open a window for ventilation purposes. Domestic ventilation can be combined with a heat exchanger for the recovery of heat. In the cold part of the year, this means that the existing room air warms the supply air from outside. This minimises energy costs. Cooking vapours or fumes are caused by boiling, frying, and roasting. They are comprised of air, water, and fat. berbel has made use of physical centrifugal force for the filter-free cleaning of cooking vapours. The cooking vapours - loaded with fat and oil particles - are greatly accelerated and pushed through bends in a targeted manner. The centrifugal force now separates the lighter particles of air from the heavier particles of fat and oil. Lastly, the fat and oil is directed into stainless steel collection trays. With centrifugal force, a berbel extractor hood reaches a fat separation rate of up to 97%. Extractor hoods transport air from the inside to the outside. However, they can only divert the quantity of air that flows into the room as supply air. It is therefore important to ensure that there is always a sufficient supply of air. This can be done via the separate berbel supply air wall box or by means of an existing window in conjunction with a berbel (remote) window contact switch.